This spring I had the chance to venture off to London, England to visit my daughter who is studying for her Masters in Musical Theatre there. I pre-booked my BritRail pass and Oyster card (for the tube in London) so I was all set to venture out on my own! I arrived before Kathleen’s spring break began – just happened to fly into Birmingham where the HUGE sewing, embroidery and crafts shows were in progress. Yes, “shows” is correct – three shows in two arenas! The NEC – site of the shows - adjoins the airport, so it is just steps from where the plane lands. And overload is the word for the 2 ½ days I spent wandering the exhibits and vendors. 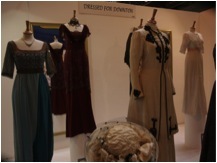 Their shows include not only merchants but also exhibits of embroidery student work, special theme exhibits, displays by many guilds or special groups such as embroiderers, lace makers, luceteers, silk painters, felters and scrapbookers. This show had a very large exhibit on the history of lace. And, I even saw some of the costumes from “Downton Abbey” on display. I managed to squeeze in a trip to the new home of the Embroiderers’ Guild (UK) in Walton-on-Thames. I spent 5 hours there examining the contents of the storage box that holds their 17th century collection of embroidered pieces. So with white gloves on my hands, and camera at the ready, I oohed and ached as I examined many precious types of embroidery. Some of their special pieces have their own storage case (photo of the gloves). The collection is stored in a special room. And on the walls around the study room are more modern examples from their collection. I even saw Louisa Peele’s chatelaine in the collection case. 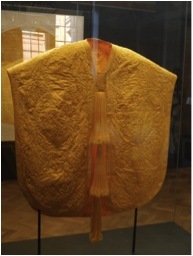 I saw the Golden Spider Cape in the Victoria & Albert Museum – the spider’s silk fiber is an amazing colour – the spools of the spider silk look like gold metal threads! On display were the cape and a large shawl. There was also a”cartoon” of the cape showing what stitches were to be used in what areas of the cape. And yes, the V&A and most museums over there do allow you to photograph as long as it is without flash. Before I left Canada, I checked the website of the Royal School of Needlework and found there was a 2 day course in Goldwork that fit into my schedule. So I made one trip to Hampton court to check out the route and train schedule and spent a lovely day touring around the public parts of the palace and the gardens. And for the next two days, I was in the classroom of the RSN, working on a goldwork piece with our tutor, Helen McCook. We were in the private part of the palace and had to be escorted into this area each day. Once class finished at 4:00, we were free to wander in the public parts of the palace if we wished. And here I am, working on my piece! While Kathleen was finishing up her term essay, I ventured out to Knebworth (on the train route to Cambridge) and took 3 days of classes at Art Van Go. This is an art supply store that also carries a wide selection of textile and stitch items! I did lots of sample pieces of texturizing fabric surfaces and foiling them. And I discovered that putting plastic wrap on not-quite-dry acrylic surfaces causes the plastic wrap to adhere permanently if not removed once you get back to the B&B! magazine and investigated online before I went to the UK). We had talks by four people throughout the day. 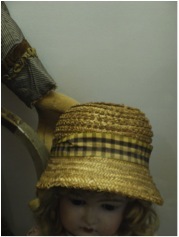 Dorset was the center of the straw hat industry in the 1800s, so the museum had many of their treasured hats – straw and sun bonnets- on display. The last speaker’s topic was “What is in the Queen’s handbag?” – You will have to read his book to find out!!!! Together, Kathleen and I also visited Oxford, Cambridge and Bath - taking more photos everywhere we went. Even photos of the brick work patterns on buildings or the flower shapes in the sidewalks – all possible design sources for embroidery. Oh yes, we even went punting on the river Cam in Cambridge! So, when you are planning your next journey, don’t forget to check out possible textile sites ahead of time. You never know what you will come across once you are there!